"I bless the newsletter, at last! At last you begin to do what I wanted so much: the newsletter". With these words the Mother of the Eucharist on October 18, 1998, blessed the draft of the first issue of the newsletter that we named "Pearls of the Mother of the Eucharist". Up to 2009, "precious pearls" were published in the newsletter, i.e. the most important teachings we had received in the weekly meetings of our community members: the bible classes and Sunday catechesis; but first of all the newsletter has allowed us to spread the messages even among those who could not access our website. The books collecting the messages were always published several months after the end of each social year, instead, through our newsletter, it was possible to distribute them in a timely manner. This was very important, for Our Lady has always prepared us in good time for what would have happened, the best way to deal with all the difficulties that we encountered. Since 2010, after the Bishop and Marisa’s departure, we decided to publish the full text of all the homilies and Bible classes that the Bishop has given us, like precious pearls, all these years. We believe that this material is a valuable asset for the Church; we cannot be jealous of it and we must share it with our brothers who could not often participate in our prayer meetings and did not have the good fortune to have a priest like Bishop Claudio Gatti as spiritual director. The layout of this newsletter is very essential, in fact it is in black and white and enriched with a few photographs representing some moments in the history of our Movement. However, the commitment is significant and it will be even more so in order to make the fruits of our labor as much as possible pleasant and nice to look at, but you too can collaborate, offering everything you consider necessary to improve it; your contribution will please us, but will especially please our Lord. 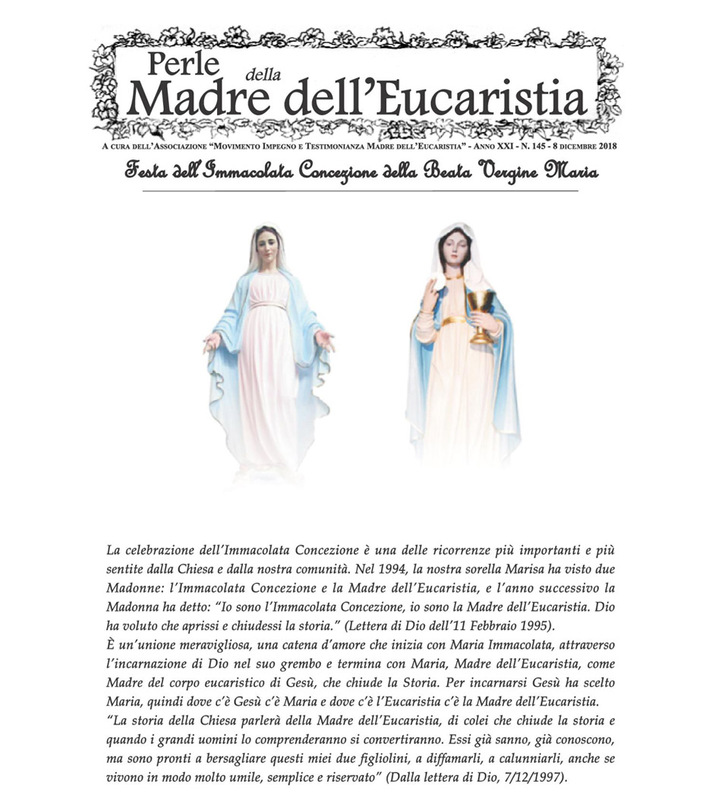 We thank you in advance for your interest and hope to meet at every issue of "Pearls of the Mother of the Eucharist".